This article is about the single by Pixies. For music groups with this name, see Debaser (disambiguation). Cover of the Debaser: Studio single. "Bone Machine", "Gigantic", "Isla de Encanta"
"Debaser" is a song by American alternative rock band Pixies, and is the first song on their 1989 album Doolittle. The song was written and sung by frontman Black Francis and was produced by Gil Norton during Doolittle's recording sessions. The "Head On" single includes a live version of the song recorded in Chicago on August 9, 1989, and a recording from Debaser December 16, 2004, in New York City appears on "Hey" – Live Pixies 2004–2005. 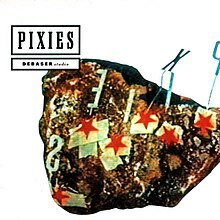 "Debaser" was later released as a single in 1997 to promote the Death to the Pixies compilation. The single appeared in three forms: live, studio and demo. A version of this song was also used in the game DJ Hero 2, remixed with The Prodigy's song "Invaders Must Die"; this mix is available as downloadable content for the game. "Debaser" is the opening track of Doolittle. This sample contains the first chorus and the bridge into the second verse. The title "Debaser" references the fact that Un Chien Andalou debases morality and standards of art, according to Black Francis. In the earliest version of the song, the line "un chien andalusia" was originally "Shed, Apollonia! "—a reference to a scene in the Prince film Purple Rain. Critic Tom Ewing of Freaky Trigger, although noting it wasn't a single until 1997, described it as "the best single of the 1980s." ^ Sisario, Ben (2006). Doolittle. 33⅓. New York: Continuum. p. 80. ISBN 0-8264-1774-4. ^ Ewing, Tom (9 September 1999). "79. PIXIES – "Planet Of Sound"". FreakyTrigger. Retrieved 7 January 2017. This page was last edited on 13 November 2018, at 15:03 (UTC).